I had a feeling that David Raison’s Mini Transat winning push-me-pull-you scow design was only the beginning of a trend, as I wrote recently here. And sure enough, scow designs are springing up all over – this is the third I’ve heard about in the last two months. This new French design is the Rêvolution 22 (note the name’s spelt with circumflex to imply the idea of a dreamboat). It is being built at AFEP Marine boatyard in La Rochelle and is, they point out, a slightly larger evolution of Raison’s Mini Teamwork Evolution. Unusually, though, this is being built in aluminium. 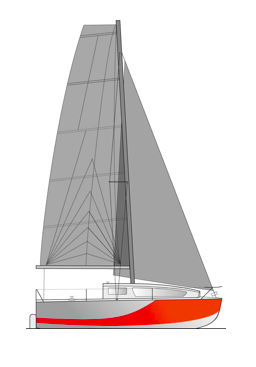 It also has a big cockpit for the length, long coachroof, twin rudders and a large fat-top mainsail. I have to be honest, though: as per my previous comments on the new breed of max volume, max beam scows, this is not… how shall I put it? …a great beauty. With its bulbous bow and squat appearance it has a cartoonish appearance, like a pocket-sized marine Peppa Pig. It will certainly turn heads.